East Cowes Heritage Centre occupies Number 8, Clarence Road, originally the premises of the International Stores, a branch of Victorian grocers and tea merchants. Since 1992 it has been the Heritage Centre and tells the history of the town with displays, maps, models and photographs. The last 200 years is portrayed in a permanent exhibition with temporary exhibitions highlighting specific aspects of the town or marking important anniversaries. 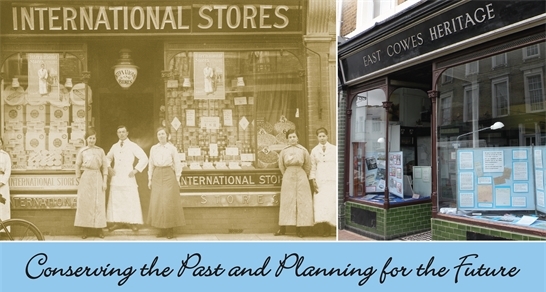 East Cowes has been the home or business location to many important people and innovative companies who have greatly influenced the town's development. Visitors to the centre can discover stories unique to East Cowes but which had worldwide importance. Find out about Regency architect John Nash, the designer of many buildings in London including Regent Street and Buckingham Palace interiors for the Prince Regent. Nash lived in a castle he designed and built for himself in East Cowes. Learn about the home for retired seamen built in memory of an explorer who was killed by an elephant. Trace the development of the Botanic Gardens of 1842 and the LIFU steam vehicle factory. See the displays illustrating the Royal Naval College and the Trinity House Depot, both of which were based in East Cowes. Concider the great influence of Queen Victoria who came to live at Osborne House in 1845. East Cowes became the centre of the British Empire when she was in residence and she died here in 1901. Shipbuilding has been a key industry for many centuries until its closure in 1965. JS Whites built many vessels for navies around the world and include a long list of ships which fought in both World Wars. The first all-welded battleship HMS Cavalier was constructed here. England's first seaplane took flight in 1913, from Samuel Saunders' workshops which went on to develop these craft for the military. By the 1950s this had progressed to the first jet-powered seaplane, the SRA1, and the largest metal flying boat in the world, The Princess. East Cowes was the birthplace of the hovercraft in 1959. Built to Sir Christopher Cockerell's design the SRN1 was the forerunner of the giant cross channel craft of the late 20th Century. Black Arrow and Black Knight were the UK's satellite-carrying rocket project. The craft were built at East Cowes and tested at the Needles before being launched into space in Australia.